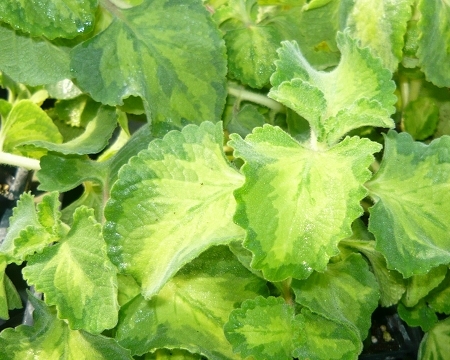 Beautiful variegated variety of Cuban Oregano. Also known as broad leaf thyme. Used in tropical cuisine. Large fleshy leaved plant is frost sensitive but makes a lovely house plant. Variegated green and yellow leaves, sometimes with a hint of pink. Hard to find variety, cannot be safely shipped during extremely cold temperatures. Tender perennial zones 11+. Live plant in 3 inch container. I was very surprised at the superb taste and unique flavor of this Variegated Cuban Oregano plant. What you would think would be more of a decorative offering, I can see all kinds of culinary possibilities. I buy herbs from many Nursery's Colonial Creek is the best ever. Every herb arrived in perfect shape well established and very healthy and a great size ready to transplant and take off growing. Love these people, plants obviously were grown and cared for with a lot of TLC. I normally would not take the time to comment on every plant purchased but this Nursery deserves it. And the price is a true bargain for the quality. I Highly recommend this grower.